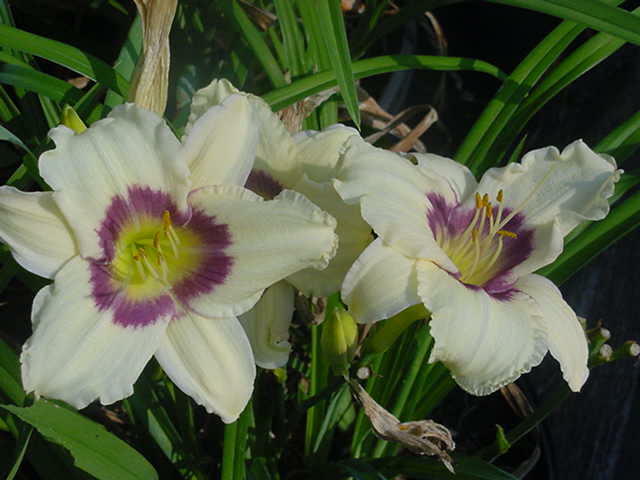 Rich cream with a striking violet-purple eyezone above a bright green throat. Vigorous grower with rapid propagation. Blossoms open well after a cool night. 25" tall, early midseason, fragrant, 4" bloom. 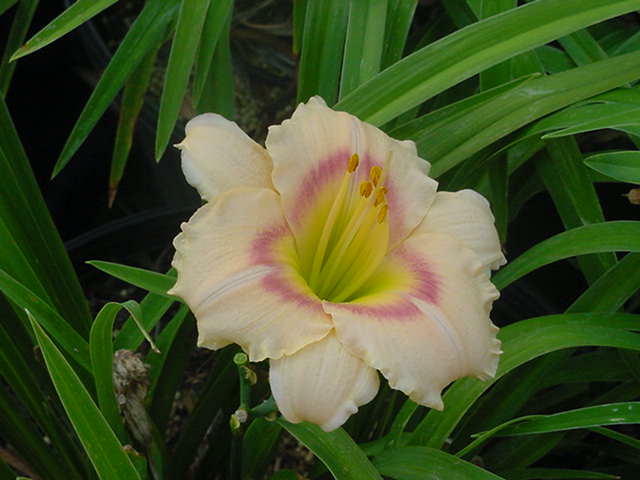 A creamy peach with a blue-violet eyezone and a green throat. Demands your attention. Has a very long bloom season for us. 6-inch blossoms on well branched 24-inch scapes. Good Rebloom. Semi-evergreen foliage. Award winning lavender with near blue eyezone and green throat. Vigorous grower and prolific bloomer. Works well in mass plantings. 28" tall, midseason, semi-evergreen, 5.5" blooms. Compact medium purple blossoms. 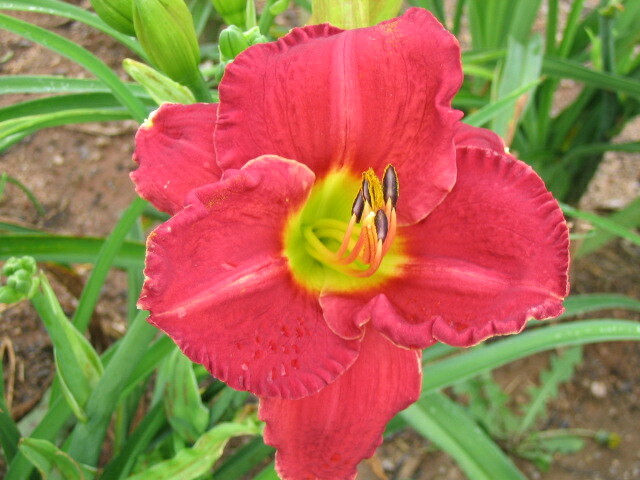 20” tall, early mid season bloom time, rebloomer, and 2 1/2” blossom size. Unique sunset Rose colored blossoms are sunfast and have good substance. 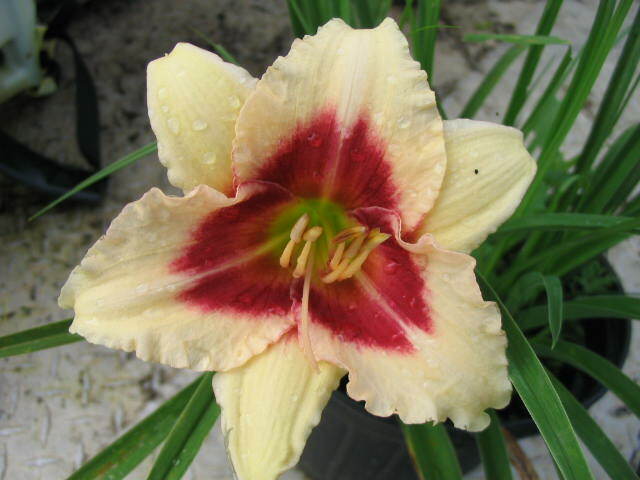 6 inch blooms are ruffled and appear mid season on 24 inch scapes. 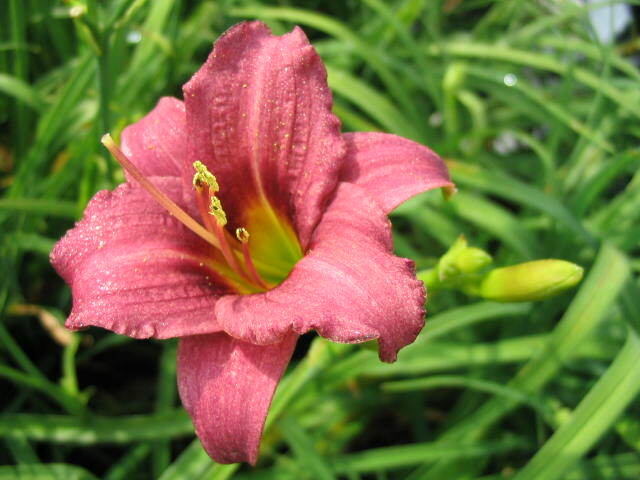 Dependable rebloom. 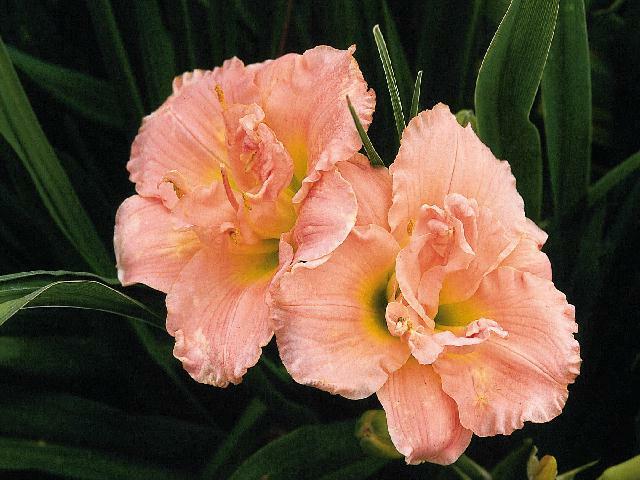 Highly acclaimed fragrant double pink. Fully double rich pink blossoms are true works of art. 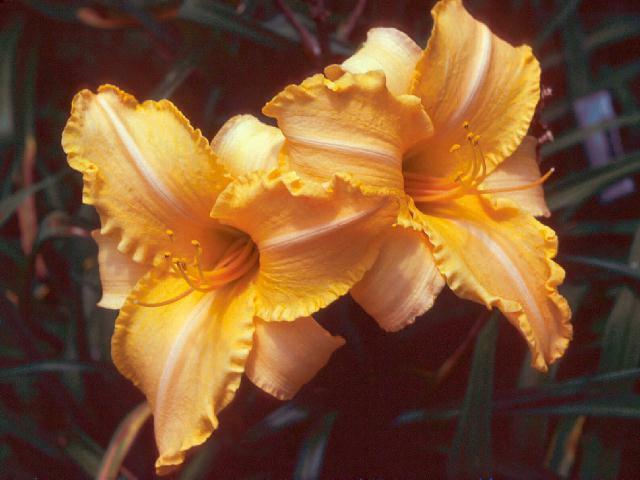 Winner of numerous awards including the top daylily award for 1993. 18” tall, mid season, fragrant, nocturnal, 5” blossom size. 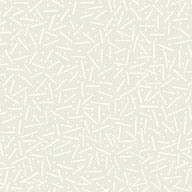 Cream pink blossoms have a delightful softly painted rose eye. Strong grower with excellent bloom form. 20" tall, midseason, 3 1/4 " blooms. Creamy pink with red eyezone and green throat. The effect is truly a “shocker”. Scapes are heavily branched and budded. 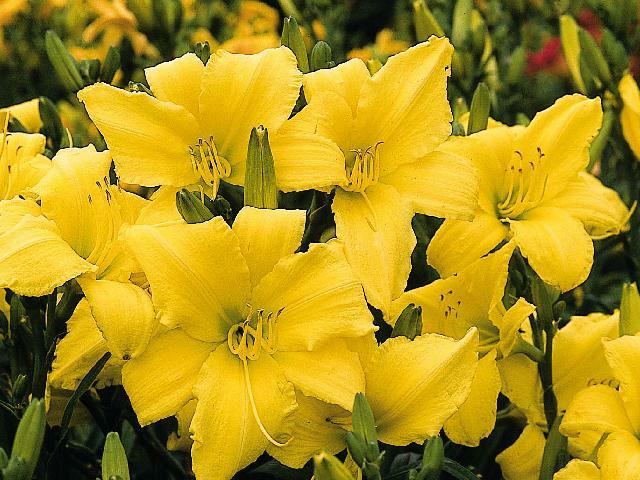 Very floriferous and strong grower. 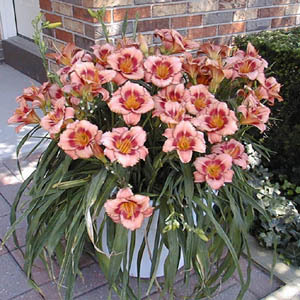 28” tall, mid season bloom time, 3 ¾ ” blossom size. 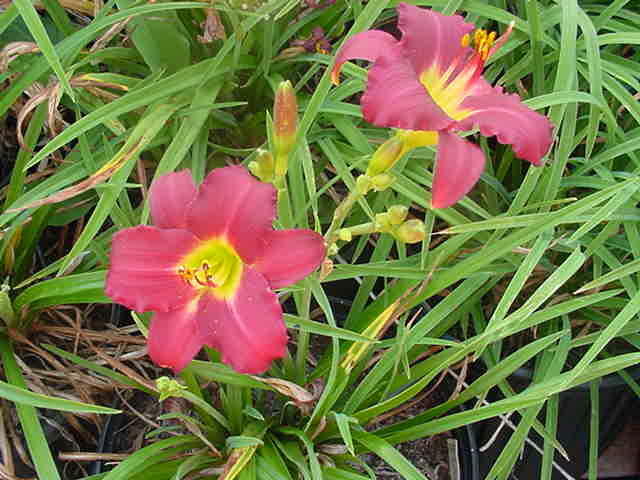 Winner of the 1998 winner as the top daylily variety. Strawberry pink. With rose-red eyezone and golden green throat. 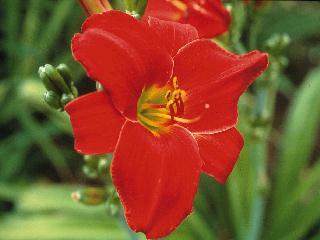 26” tall, early mid season bloom time, rebloomer, extended bloom open time, semi-evergreen foliage, 4 ½” bloom size. 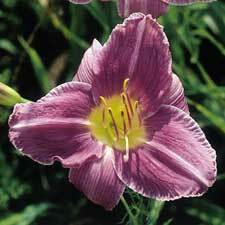 One of the top new daylily varieties on the market today. Sought after by many collectors. Clear pink petals have a rose colored braided edge and a matching eye. 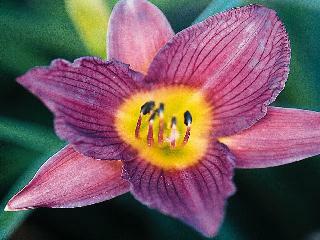 Blooms are 4 1/2 inches and borne on sturdy 26 inch tall scapes. 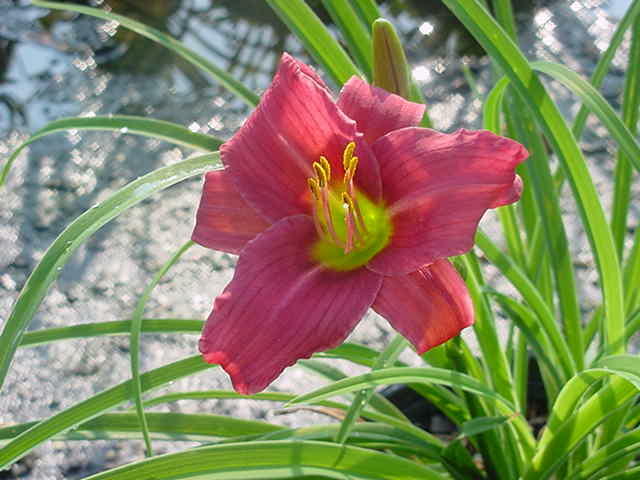 Dependable rebloom, fragrant and semi evergreen foliage. Very limited supply.